I seldom use my sourdough during the summer. I'm too busy with the yard and garden - preserving and canning the results. You are supposed to feed the dough every ten days but I find that you can extend that. If I don't feed the dough for two or three weeks, I leave it out of the fridge for a day or so after feeding it. I find the dough is still bubbly. If you leave it too long between feedings, I find it gets too sour for my liking. In those cases, I feed it, leave it out for a couple of days and then feed it again. For the summer, I usually freeze the sourdough. According to my Robin Hood pamphlet on care of sourdough, it suggests not freezing it for more than three months. Well, summer here is longer than that so I froze mine for around five months. To revive the dough you thaw it slowly in the fridge. Leave it there for at least 24 hours. Feed the dough and leave it out for a day or so. It should then be ready to use. I plan to leave it out for awhile and then feed it a second time before using it. I will be adding more sourdough recipes as the year progresses. Hi Joan...I took your seeds to the store today to sort out and get into the mail. We got inundated with more Christmas stock, but I'm sure I'll have time tomorrow. I am so sorry it's taken me so long. I'm usually pretty darned punctual. 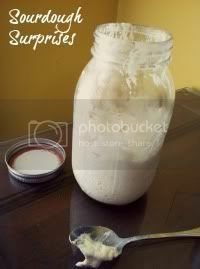 My sourdough starter occasionally suffers from neglect. If I feel I've let it go a little too long, I found that feeding it with one round of dark rye flour helps to kick it back into gear. Subsequent feedings I just revert to the unbleached high gluten flour, and the rye quickly disappears. I've been able to bring starter out of the freezer after a year with no harm done too. May take an extra feeding or two, but it comes back. Your seeds are in the mail!!!!!!!!!!! !